My hooping DVD is based on the hooping workshops which I have run over many years. It teaches you how to start with a hoop and how to work with the hoop all over your body. You can learn the fundamentals of Hoop dance through the moves explained here. There is also a section on Hoop Swinging (aka Hoop Poi). It starts with a beginner section. 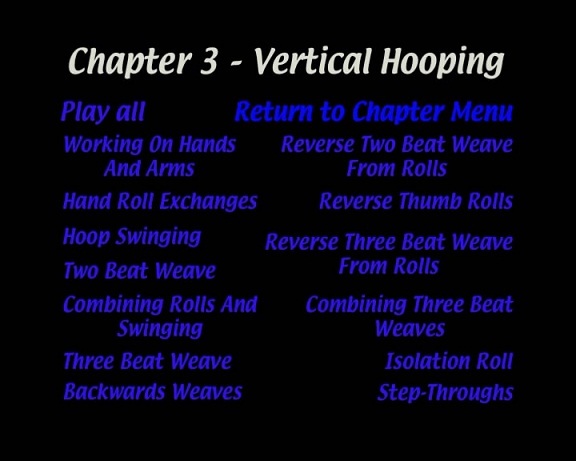 Each subsequent chapter looks at a specific area of hooping and progresses in difficulty. By combining close up and wide shots I clearly show how each move works. Slow motion sequences help to make this clearer and there are step by step instructions for each move. My aim is to teach good technique. it will be easier to learn more advanced moves and there is less likelihood of injury through strain. Working the hoop all over the body and moving the hoop from one place to another is a good workout for the whole body as well as the stomach and core. The DVD covers 53 moves plus variations over 6 Chapters and has a runtime of 80 minutes.